Having deferred the Shelley Beach – White Beach walk yesterday, we decided to take advantage of reasonably good weather, and tackle this walk on Day Two of our week away. 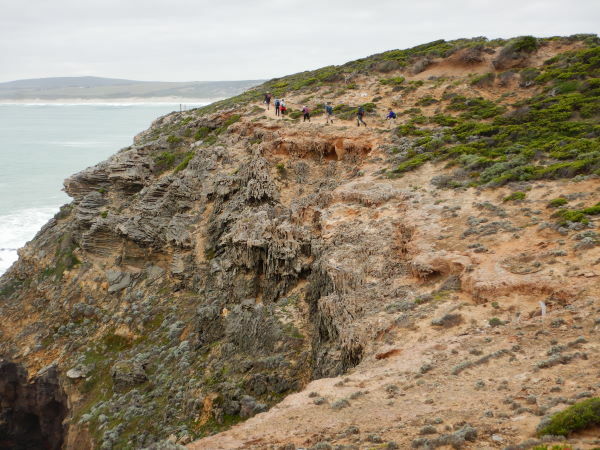 This walk covers the perimeter of Cape Bridgewater, and was likely to be the highlight of the week. Three groups set out, two on the full perimeter (in opposite directions) and a shorter walk group who journeyed from the Blowholes Road to Cape Bridgwater township. Expectedly, there was plenty of interest on this walk, geology being the main topic of conversation as it is certainly a very ancient, and rugged, coastline. Of particular interest were the Blowholes, the Petrified Forest and the convoluted rock strata that were visible for most of the walk. Distance covered was about 18km, a few kilometres more that the guide books indicated, but we all coped with the extra distance. 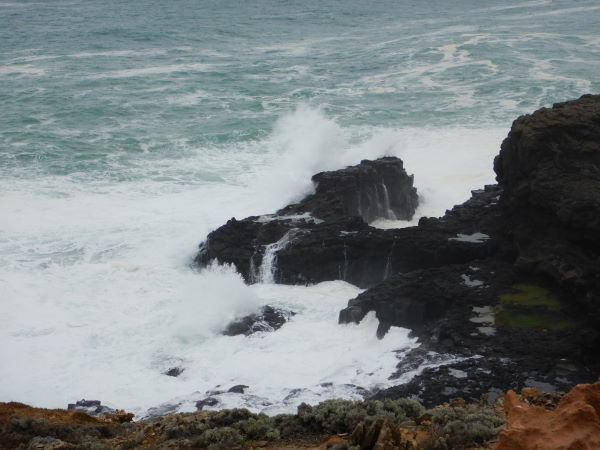 We swapped car keys at the mid-point of the walk, and regrouped at the Cape Bridgewater Café for moccas etc, and a sticky cake. Overall, an excellent walk that is a showcase for the volunteer workers who established the GSWW, and who are still actively involved in its maintenance.